Yet he was able to turn his life around to become an incredible peace activist, mentor to countless youth, an internationally known poet and best selling author. I knew his life story would really connect with the men we’ve been working with, and it was a real treat and an honor for all of us, myself included, to be able to spend time with such an inspiring man. I encourage everyone to check out his work here. In San Bruno, there is an incredibly inspiring young man who we’ve been working with for about 6 months. To honor his privacy, we’ll call him Juan. Juan had read Luis’ memoir a couple months ago. He was so inspired by the story that he wrote to Luis’s publishing company. Juan said that he didn’t even expect any response at all, never mind a response directly from Luis. Not only did Luis write back to him personally, but the universe did him one better. 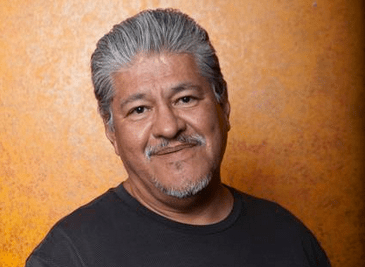 Just two months after he wrote to the publishing company, Luis was standing right in front of him, sharing his story with Juan and the others in the pod. I still remember the smile on Juan’s face as we walked into the pod with Luis. Even through his tattoos and his bright orange jumpsuit, his innocence beamed through that smile. At the end of the day, he was a young man who was about to meet one of his heroes. We talk a lot about having faith that the universe is on the side of justice, but we need to put out there what it is that we want. Too often we spend all our energies complaining about the things we don’t like that we don’t invest in what it is that we want. Juan put it out there into the universe that he wanted to learn more from Luis, and within two months, the universe responded. Just one more small example of how the universe is, indeed, on the side of justice. Most of the workshops that we do in the county jail systems are mandatory for the participants. This means that very often, we start the morning off with some folks who are not happy to be there, and they let us know it. The first time we went into the women’s jail in downtown San Francisco, we walked into a room filled with conflict. Several of the women were woken up by staff just minutes before the workshop began, and was told that they would have to sit through two full days of class. A couple of women shared with us very openly how unhappy they were to be in the room with us. On top of that, we were told later by the staff that these women were the women with the hardest “behavioral and attitude challenges” in the jail. Great. But we moved on. We had faith that as long as we stayed confident in our commitment to nonviolence, as long as we honored each participant and created a space for them to open up, that they would do just that. And within hours, smiles started to crack open, laughter could be heard in the room, and the conversations started to flow. Yet even as we create these spaces, there are regular reminders of where we are and the pain that so many of these participants carry with them. Perhaps because of how crowded the room was (it was a tiny classroom with barely enough room for us to move around), this was a workshop that was filled with conflict. Arguments and conflicts between participants seemed to occur much more frequently that day than in other workshops we’ve done. But by the end of the two-day workshop, a room that started with so much conflict was transformed. During our closing circle, one woman shared with us that when she walked into the room on the first day, she didn’t know if she could make it through the workshop without getting into a physical altercation: a woman that she had been beefing with was also in the room. This woman shared with us that after the first day of the workshop, she was so inspired that she took the courageous step of reaching out to the other woman that evening, and they were able to resolve their conflict. They showed us the power of reconciliation by embracing in a hug in the middle of our circle. An incredibly inspiring and fitting way to end our first two-day workshop in the woman’s jail. Another conflict flared up recently when working with a group of men. During a small group activity, two men began arguing with each other and one of them jumped up out of his seat, ripped the piece of butcher paper the group was working on, and started to yell at another participant. The two had to be separated by a deputy, who actually handled the conflict in an incredibly kind and nonviolent way. The deputy could have easily locked the two of them back in their cells for the rest of the day, or put the entire pod on lockdown for the day cancelling the rest of our workshop. Instead, he took one of the men aside with his arms around his back and talked to him until he was able to calm down, and put him right back into the group. A little while later, we were engaged in another small group activity where we asked the men to come up with a role-play of a conflict. We do this as a way to practice analyzing conflict situations. The two men ended up in the same group again, and without any instruction or suggestions from us, they decided to act out the conflict they just went through, only they reversed roles!!! One of the first things we talk about in our workshops is the importance of seeing conflicts from the other person’s perspective. Apparently they were listening. Here were two men – one black and one white – who put themselves in the other person’s shoes just hours after they were in each other’s faces. One of the great honors for us has been conducting trainings in the community for seasoned activists who have been arrested over 100 times for acts of civil disobedience. These are people who have been involved in doing social justice work for longer than I’ve been alive, and the idea that people with that much experience can come to our workshops and learn something new has been such a humbling honor. Some of them have even come to our workshop multiple times! Recently when working with a group of women, we met another veteran with a very similar – and at the same time a completely different – experience. This woman had been incarcerated over 80 times throughout her life. None of them had been for civil disobedience, and none were in the name of peace. Yet there they both are. Coming from such vastly different experiences, in such a different place in their lives, going through the same workshop, having the same discussions, taking away lessons that will help them in their respective lives. As we always say, conflict is universal and we all share so much in common with each other than we know. Speaking of people who have had experiences lasting longer than I’ve been alive….. I’ve recently had the honor of doing some presentations for, and sitting in on some presentations by, a group calling themselves Tribe 928. This is a group of 34 men who collectively have served 928 years (quick shout-out to Jacques and Insight Out). I was speaking with one of the inmate facilitators who co-leads the group, and he shared with me that he has been incarcerated for 34 consecutive years. And even after spending an entire lifetime in some of the most violent environments in the country, this man is nothing but love. I have yet to see him without a smile on his face. It’s incredible to think about how strong him and the other men in the group are to not let the violence that surrounds them affect who they are and what they want to represent in the world. To be a peace warrior in a place where violence is the norm is something that takes incredible courage, and to do so for 30+ years takes incredible strength and integrity. I’m so incredibly honored to have met with men like them, and hope to continue to build with them inside and outside of those walls. This entry was posted on Thursday, February 21st, 2013 at 11:02 am and is filed under San Bruno County Jail. You can follow any responses to this entry through the RSS 2.0 feed. You can leave a response, or trackback from your own site.